As the opening volley of this fall's big "Ultimatum" crossover, which will be supplanting the regular Ultimate X-Men and Ultimate Fantastic Four books for the entirety of its run, this issue hurriedly throws the entire imprint's current state of affairs out of whack. When the X-Men of the future arrive in the present, they do so with one clear and simple objective: find the present iteration of the Fantastic Four and blow them to smithereens. And, considering the extra years' worth of experience these old vets have over their much younger targets, it really shouldn't be much of a fight… that is, until the future Fantastic Four also appear to join in the fray. Collaborative writers Aron E. Coleite and Joe Pokaski don't pull any punches, throwing their readers off the deep end from page one with an unfamiliar team of mismatched X-Men from the future driving a commuter train off its tracks. 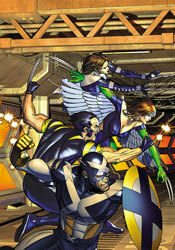 The team's names are recognizable, but their faces and powers are all wrong: Rogue has wings, Kittie Pryde shoots webs, and Captain America is wearing an X across his chest. I guess that's one way to quickly, convincingly teach your readers that nothing's off limits in this series and no one is safe. No one except Spidey, that is, as Marvel has already announced that Ultimate Spider-Man will continue uninterrupted beyond this series. The issue never really slows down long enough to let its readers catch their breath. One jolting, unexpected scene segues directly into the next. Each member of the cast speaks a mile a minute, without individuality. This isn't a cast of characters, it's one voice spread over about twenty different bodies. This issue is a wild ride, not without its moments of inspiration, but it's far from being anything I could call well written. It's a lot of good ideas and a lot of bad ideas all thrown into the same bag and shaken around a bit. Dan Panosian and Mark Brooks take turns holding the artistic reigns this month, and have so little in common that the jolt the reader receives upon jumping between their styles is akin to hitting a speed bump at sixty miles per hour. Brooks plays the bookend, penning both the issue's opening pages and its conclusion, and is the better of the two. His bold, textured style is heavily influenced by the work of Chris Bachalo, and while it lacks the flair for the spectacular that Bachalo brings to the table, he makes for a fine stand-in during more static, postured moments. Brooks's characters never seem comfortable, however, and their battle poses are so awkward and strangely composed that his work is sometimes difficult to traverse. Panosian's artwork is comparatively much more cartoony, often to a fault. While he's being asked to deal with very serious moments that could have long-reaching implications, (rumor has it that one or more major Ultimate books will end following this crossover) his thin-lined, exaggerated work often betrays the story's intended tone. His contributions are like a more over-the-top J. Scott Campbell, lumpy and curvy and stylized beyond the point of no return. Not so good. In fact, that phrase pretty much embodies my thoughts about this issue as a whole: not so good. It's a lot of hot air, plenty of chances for the superheroes to flaunt their powers without that compelling of a plotline. Although the writers have tried everything they can think of to convince me that the sky's the limit here, that important characters will meet their end an there's no limit to how far they're willing to go, I couldn't shake the feeling that a lot of this storytelling is extremely safe. An uncertain artistic offering doesn't do much to improve that situation. Ultimate X-Men or Ultimate Fantastic Four fanatics might find something of value here, but the rest of us would be better off skipping it.